Early Qing Dynasty, Jin guard(the imperial guards of Ming) assassin-ed into the palace of the general Li, won the Chicken Cup back. 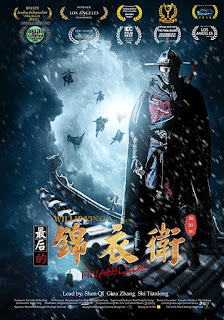 three hundred years later, inside a temple, the lead of Jin guard He Fan is dying to protect the chicken cup from the treasure hunter David Wong, He fan died in the battle, only survived is his son He Xingyun, the treasure got into the near lake. Until now, The mystery Chicken Cup shows up in the auction, The hunters stolen the Cup, but He Xingyun stopped them and fought them off. The young boy Li Moxun saw his moves and so admired and wanted to be his disciple, but He Xingyun worn a mask of Jin guard and also disappeared immediately after the suffering. Li Moxun then seeks for him everyday, and found him as a cook in the noodle shop. Then Li Moxun started to show his attitude to be the disciple of Jin Guard He Xingyun, at the start He Xingyun did not accepted him but after Li Moxun passed many test by the master, he became the Disciple of He Xingyun who is the only survived Jin Guard, Li also knows his mission is to protect the treasure Chicken Cup, until then he knows that there is a huge mystery hidden. So the treasure hunters came, who are armed Ninjas, the battle went on, Li Moxun's master He Xingyun got badly injured when fought the Ninjas. So Li Moxun gets on with his mission to protect the Cup also fights for his master and friends. The Chicken cup is a treasure that passed by the Emperor of Ming, Jin guards are the imperial guards of Ming Dynasty who got the mission to protect the Chicken Cup. And after hundreds of Years, the Chicken Cup still exist also the only survived Jin guard He Xingyun. The treasure hunters willing to kill him and get the Chicken Cup, He Xingyun then passes on his mission to the young boy Li Moxun, the battle went on again.